Office Hours: Reception hours are in keeping with the class schedule. We are open 15 minutes before each class. 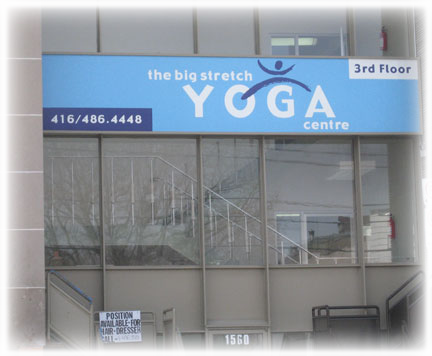 The Big Stretch Yoga Centre is located in Toronto on the west side of Bayview Ave., between Davisville Ave. and Eglinton Ave. East (at Belsize Drive). It's located across the street from Scotiabank and Starbucks, and is kitty-corner to Royal Bank. Parking: There is 2- to 3-hour metered parking on Bayview Ave. (free until l p.m. on Sunday mornings) or free local parking on side streets. 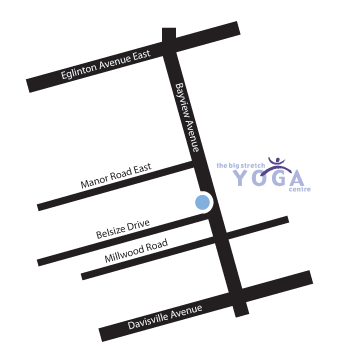 There is also Green P parking by TD/Canada Trust at Bayview Ave. and Millwood Road. TTC: Take the Bayview 11 bus from Davisville station or the Davisville 28 (rush hour only) bus from Davisville station, or get off any Eglinton bus at Bayview and walk a few blocks south.